It’s the afternoon of garbage day – not the best time, as a lot of people still don’t have their stuff out. Pickup around my area is about 7 or 8, and there’s a fair bit of stragglers. I decided to go to my friend’s house and give her dog a walk, as good an excuse as any to take a walk. It’s a chilly day, and there’s a wind that made me wish I wore gloves. We’re coming off some record-breaking warm weather here (26 degrees! ), so I wasn’t quite prepared. I do work as a mover, on call, where the jobs are disproportionally around the end of the month (for obvious reasons). I’m surprised that I haven’t worked at all recently. Part of me wants to be working right now, but most of me is glad to have this time to myself. I got a good shift for Thursday, so I’ll make a bit then at the least, and I’ll probably get some good work on my birthday again too (March 30). I just hope it’s not the 16 hour shift I got last year on my birthday. We shall see. It doesn’t take more than a few busy days to make a decent chunk of money anyhow – that’s why I don’t mind it too much. Anyways, to the garbage. I’ll likely take another walk today, though I’m feeling a bit sleepy. Maybe it’s the chamomile tea. 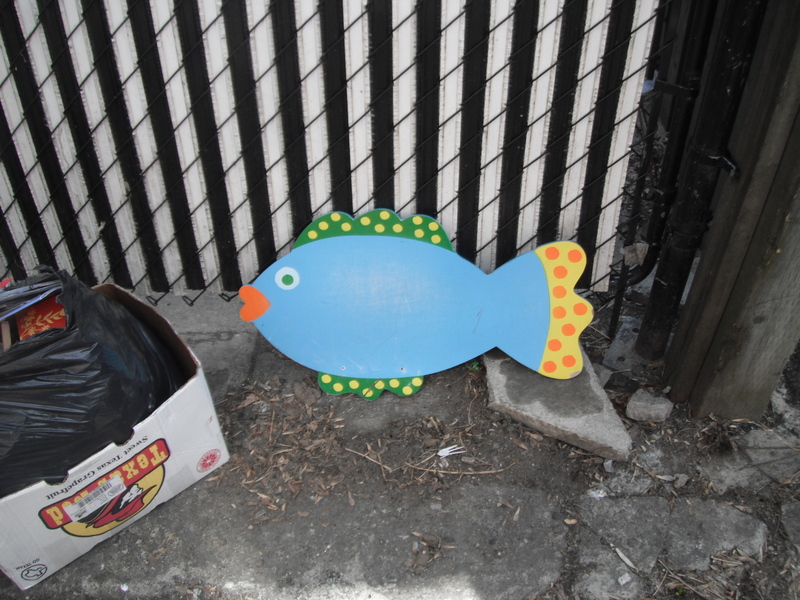 I found this fish in the alley next to Parc, between St Viateur and Bernard. It was with some other kid-type stuff. I know a guy who lives not too far away, so I decided to gift it to him. Who knows if he’ll keep it, but it’s good for a laugh. 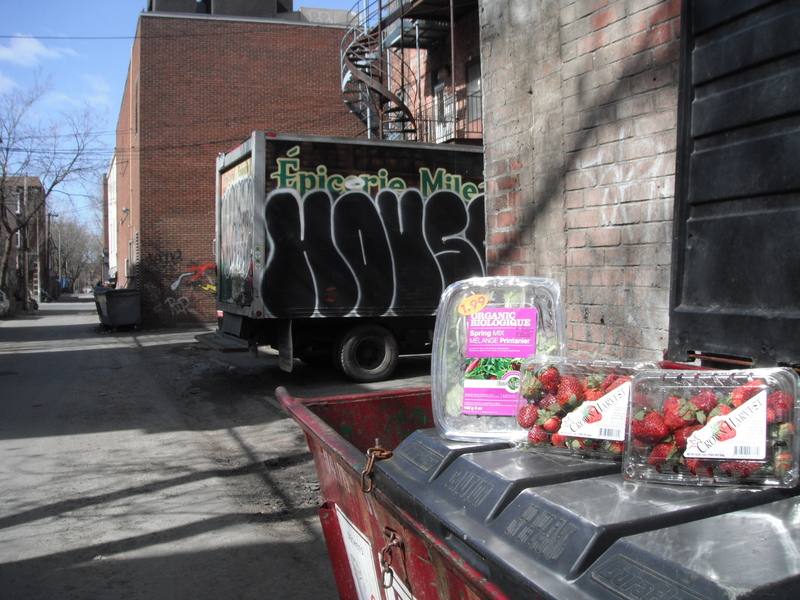 There are dumpsters for some grocers in the same alley, and I found some decent looking strawberries and some greens. This is the first time I actually found dumpster food here. I gave the greens and one strawberry box away, and kept one myself. Rubble piles like this intrigue me too. Things like this make me think I should change my blog name to just “Things I find.” I’ve found a few good things in places like this, like a really cute antique-y bowl I keep stuff in in my room. 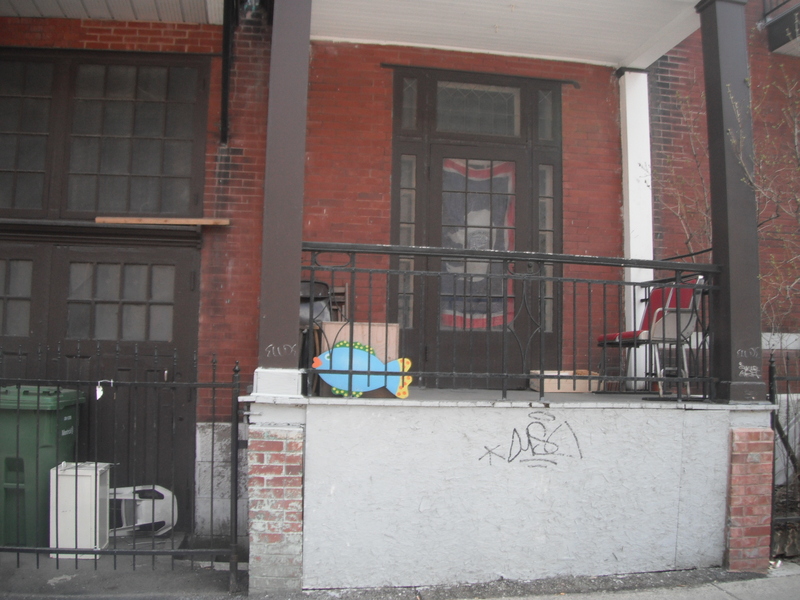 This is near Van Horne – Parc, and the place to the right is an abandoned building I explored a bit after. I didn’t find much in this rubble pile. 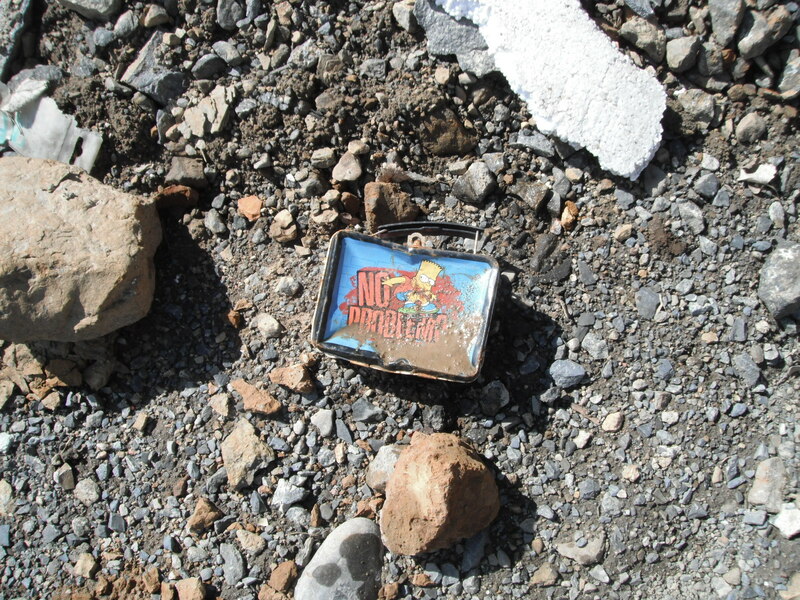 There was this Simpson’s lunch box thing, but it was pretty dinged up. Might have had a bit of value if it was in good shape, but alas. Random pile of stuff next to that abandoned place, close to the railroad tracks. I couldn’t figure out what these ceramic things were for. I left all this behind. Another rubble pile, this one obviously too far gone to interest me for long. There was a toilet seat that looked okay. I’m kidding. Here’s Karma! Definitely not a dumpster dog. She loves eating garbage though. At one point she decided she wanted to chew on some wet kleenex on the side of the road. I’m not going to let her lick me for a while. An odd assortment of plates, bowls, and some other odd things I pulled out of the bag. I got 2 pennies out of here. For a while I stopped picking up pennies, but I figure if it takes 2 seconds to pick up a penny, the for that process I’m making a (prorated) 18$ an hour, which is a pretty good paying job. I took the plates I set individually on the ground, the pot, and the glass vase, which is a nice old-school heavy glass. I left the rest on the side of the road for others to pick up. Not sure if they will, or if it’ll just be a nuisance for the garbage men. I’ll probably go back later and check it out. Too late, there were a couple of decent ones but I left them behind. I was thinking they might be for hookas. It’s starting the 1st now? I may be able to make the 2nd, but it might be the 3rd or 4th as well. I LOVE THIS!!! What a wonderful walk! And yes, don’t let Karma lick you for at least a day or two. It is the part generally covered in foil and the bowl hold the shisha tobacco.